The somnolent hours of Vancouver City Council drudgery occasionally erupt into situations that vividly instruct. The recent treatment of a councillor who dared to raise the issue of socio-economic class interests created just such a graphic scene on Wednesday 3 April 2019. For the dramatic script itself, skip straight down to the appended transcript of what three councillors said and did. After all, the main purpose of this essay is to document this one particular nervous crack in Vancouver's faux-civic façade. The rest of the writing that lies in between this and that offers context and annotation and perspective. Plot note for persons unacquainted with the arcana of Vancouver City Council: to "refer a motion" is a standard procedural maneuver to inflict bureaucratic pigeonhole death on councillor proposals. Second backstory note. In a nutshell, "Rental 100" amounts to shoveling millions of public dollars into the pockets of developers as "incentive" to build spiffy expensive new rental buildings for corporatized upmarket renters, like the phalanx of 400 Netflixers soon to inflict themselves on Vancouver. Typically, developers destroy existing more spacious and more affordable apartment buildings to create these new profit opportunities. The initial gift of public money is then followed up with no developer accountability. For ten years now the City of Vancouver has left "incentivized" developers free to charge whatever escalating rents the market will bear. Rental 100 was initiated as a "short-term" program in 2009 to bail out developers, who were purported to suffer from the 2008 economic downturn. Just as the United States government rewarded rogue financial institutions because they were Too Big To Fail, so did Vancouver City Council seize opportunity to give similar treatment to a developer sector that has mushroomed mightily in the years following. Think of public dollars as manure for noxious asocial weeds. So, I'm not going to vote for the referral, and I hope you guys don't too. It depends on who you're sticking up for. It's a class issue, folks, and I'm sticking up for the renters, the lower income renters. Melissa De Genova immediately whined and pounced, asking meeting chair Adriane Carr to slap down on Jean Swanson. Her cryptic mention of "5.2" is a reference to the "rules of conduct" section of Procedure By-Law No. 9756. Specifically, in this case, 5.2(g) states: "A Council member must not question the motives of a Council member." Chair Adriane Carr rapidly and nervously obliged complainer De Genova. Nevermind that sticking up for lower income renters was simultaneously being shoved off the table. Swanson's notion, that City of Vancouver could briefly hit the pause button on big handouts to developers, incited vociferous sky-is-falling fears and threats, notably from Mayor Kennedy Stewart and City Manager Sadhu Johnston. Rationality would suggest that if corresponding disaster had not already struck repeatedly throughout the many years prior to 2009, a few months of pause-for-review could not wreck anything. The Kennedy-Johnston view seems to be that Vancouver's shaky economy, ever more excessively tied to the churning of concrete into condos, must be stabilized by the urgent installation of every possible construction crane. Time out here for some linguistic therapy. 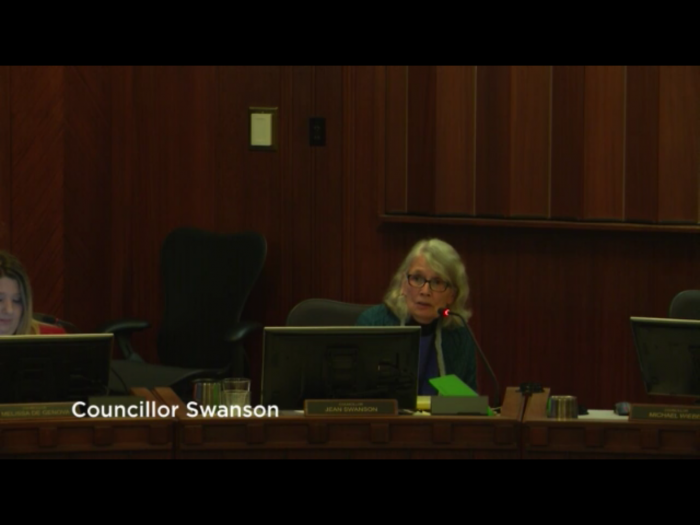 Call it mental rehabilitation offered to a bunkered-down Vancouver City Council. Lately a strange phrase has emerged at Vancouver City Council: "impugned motivation." This almost meaningless multi-word neologism occurs only five times among the billions of words indexed by Google. Less strange phrases are "imputed motivation" (323) and "inferred motivation" (925). Google's top-of-chart listing for "imputed motivation" points to a book titled The Essential Weber. It seems pretty clear that Council is sociology deficient. Maybe troubled councillors, unconscious to the point of not even being able to see what their problem is, should spend some quality time with Max Weber? Contrast the "impugned motivation" shtick that turns Vancouver's municipal legislative body into a gong show with the overwhelming concern of judicial bodies to uncover and determine intent. In a court of law, assessment of motivation often seems of paramount concern. What a contradiction. This looks like the difference between making the law and being subjected to it. If you get to make the law, you start to think of yourself as untouchable dictator, with the arrogant right to deny that you should ever have any accountability for your motives. Pseudoscientifically, you go even further. You pretend that you really have no motivations. You are merely a rational particularity that flits around according to the laws of social physics. There's no controversy about what atoms do. Politicians hate controversy. And their own accountability. Socio-economic class aligns with interests — whether the interests of the privileged or the interests of the oppressed. To the extent that these interests constitute motivations, Vancouver City Council presumes a social unconscious that should receive no therapy whatsoever. There is something utterly ridiculous about a system where social reality cannot be talked about, so that a reified illusion of objectivity and rationality and equity can be maintained. Thus does solipsistic "procedure" toddle its bureaucratic steps along a neverending Escher stairway. Meanwhile, Rental 100 remains an accelerant that Vancouver City Council firehoses onto a conflagration of displacement, demoviction, and gentrification. So this motion is being criticized as not solving problems or issues, and not proposing solutions. So who is policy for? Who are solutions for? We heard eloquent speakers today. Speakers who are being renovicted. Speakers who are paying too much rent. Speakers who are living in cars. Speakers who are working two jobs so they don't have a life because their rents are so high. So most of my resolution is about a report back — a very mild thing. The controversial part is about suspending the Rental 100 program — not the applications that are in the pipe, there could be hundreds of those, but new applications that havent been made yet. Not suspending them forever, but until we get a report back, which is probably a few months. So its about suspending a program for a few months. A program that gives millions in incentives for apartments that have high rents, and apartments that have growing rents. For apartments that can demovict tenants from existing affordable units. For apartments that increase land values and other market rents throughout the whole city. Uh, one of the speakers here just googled craigslist, and I did too. Uh, apartments in the vancouver area over $2000 a month — there's 3000 of them. Ah, yes, Councillor De Genova, go ahead. I feel that it was implied that anyone who votes for this referral is not sticking up for renters. And I waant to be very clear that that is not the case. 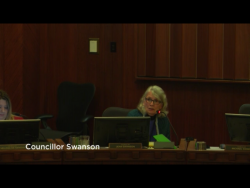 Under 5.2 — because I'm not using this as an opportunity to speak — this is actually something that I would like you to rule on, because if you heard it the same way as I did, Chair Carr, that's, uh, that's exactly what I-I understand Councillor Swanson accused anyone who votes for this referral of doing. Actually, uh, uh, I-I will sustain that-that point of order, Councillor Swanson. Um, you know you are impugning motive, um, in the vote on this issue, and, uh, and uh, yeah, I-I would ask you to refrain from doing that.